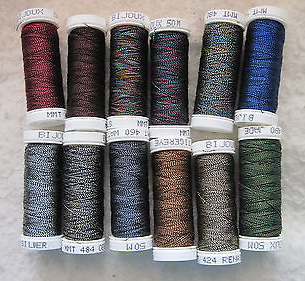 Bijoux is a blending filament that you can add to other threads yielding a subtle sparkle to your stitches. The core is white or black. The white core adds an opalescent effect. The black core adds a jewel like look. Unlike some other blending filaments, Bijoux is very strong, and holds up well to surface embroidery stitches. Bijoux can be used on its own in multiple ply to fit the canvas.